Evidence the Gulf state has a 'Plan B' in the event of Iranian nuclear proliferation, which could mark the start of a nuclear arms race. "What did we think the Saudis were giving us all that money for? It wasn't charity," one "senior Pakistani" told the BBC. Another unnamed source - identified only as a former Pakistani intelligence officer, said that in his view "the Pakistanis certainly maintain a certain number of warheads on the basis that if the Saudis were to ask for them at any given time they would immediately be transferred." If true - and both the Saudis and Pakistanis deny that it is - such revelations would confirm fears of the onset of a nuclear arms race in the event that efforts to curb Iran's nuclear program fail. It would be a convenient arrangement for the Saudis, who have long called for a "nuclear-free Middle East", but have been watching with alarm as the Obama administration warms ties with Tehran whilst the latter continues to move forward with its nuclear program. By effectively outsourcing its own nuclear option the kingdom can continue its calls for nuclear disarmament and non-proliferation, whilst maintaining an atomic safety net in reserve should all else fail. Senior US officials have also voiced their belief that an arrangement of some kind exists between the two Sunni Muslim states, both of whom neighbor Shia Iran. "I do think that the Saudis believe that they have some understanding with Pakistan that, in extremis, they would have claim to acquire nuclear weapons from Pakistan," claimed Gary Samore, who was US President Barack Obama's counter-proliferation adviser until March 2013. The precise nature of the arrangement remains unclear, and could range from a simple "cash and carry" arrangement whereby Pakistan directly sells the Gulf state ready-made nukes, or something less direct, such as the deployment of Pakistani nuclear positions in Saudi Arabia. 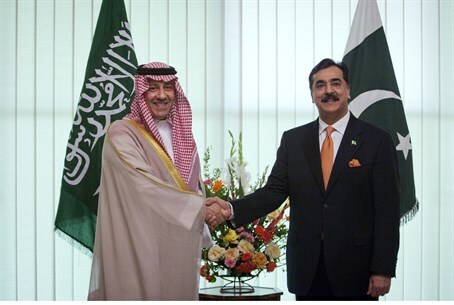 But skeptics have pored doubt on both scenarios, noting that the former would effectively cast Pakistan as a rogue state, willing to flog its nuclear wares to the highest bidder, and that the second option - the presence of a foreign nuclear "protector" on Saudi soil - would seriously dent the Sunni Arab state's ambition to position itself as the leading Sunni Muslim power. Nevertheless, while neither arrangement would be "ideal" for the two countries, a sense of desperation might force their hand. Moreover, fears in Pakistan of damage to its relations with western powers in the event of such a deal could be offset by Saudi financial largess, of the kind the Arab state has shown it is more than capable of providing to its allies in the past. The report noted how since the US invasion of Iraq and ouster of Sunni Arab strongman Saddam Hussein in 2003, with the Saudis perturbed at the removal of one of the last remaining bulwarks to Iranian regional influence, a steadily increasing flow of evidence has emerged suggesting the existence of such a deal. For example, US State Department cables posted by Wikileads record how in 2007 US diplomats at the American mission in Riyadh were being asked about US knowledge of "Saudi-Pakistani nuclear cooperation". According to the leaked cables, Pakistani officials told their American counterparts that "it is logical for the Saudis to step in as the physical 'protector'" of the Arab world by seeking nuclear weapons. Moreover, in the years following the invasion senior Saudi officials explicitly warned the US of their intention to respond to an Iranian acquisition of nuclear weapons by obtaining an arsenal of their own. The BBC report noted that such threats could have been mere "bluster", and pointed out that much of the intelligence on the secret Saudi-Pakistani deal comes from Israeli sources, and that Israel too has a vested interest in "wanting to worry the US into containing Iran." But nonetheless, amid a significant deterioration in US-Saudi Arabian relations - the result of growing distrust over the current American administration's readiness and ability to contain the Iranian threat - the prospect of Saudi Arabia "going it alone" is not so outlandish. A recent Wall Street Journal report on the crisis in relations between Washington and Riyadh - including a direct announcement by Saudi Arabia's spy chief that his country is scaling back its cooperation with the US - noted that Saudi diplomats had threatened US officials that Riyadh could "seek alternatives" to the mutual-defense treaty between the two states. Against that backdrop the "Pakistani option" seems alarmingly feasible.